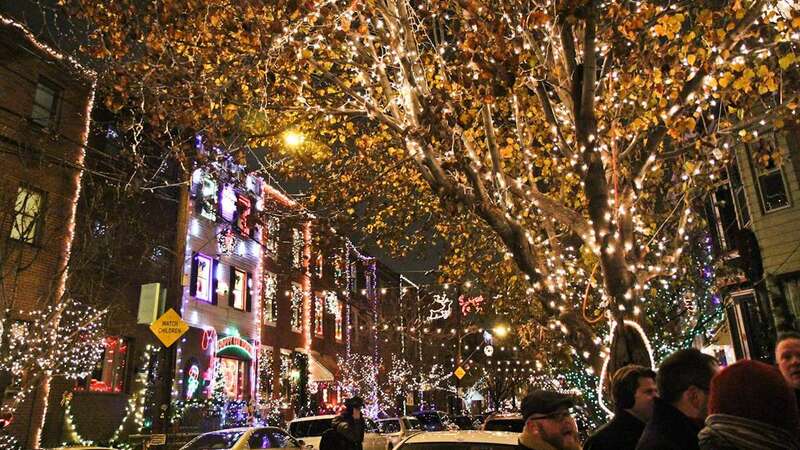 South Philadelphia has long been known for its holiday light displays. 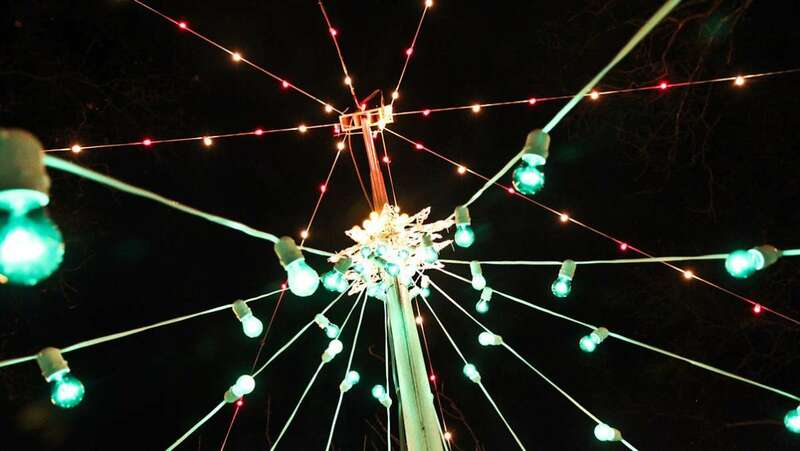 Entire blocks keep the tradition alive by stringing lights to connect each rowhome, while some new residents have added a twist to holiday window displays. 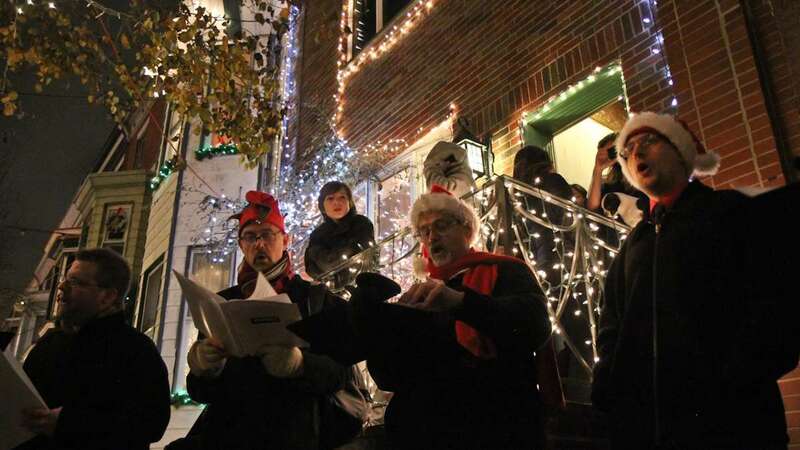 On a recent evening, the Philadelphia Gay Men’s Chorus gathered on the corner to sing Christmas carols underneath the glowing lights. As they began, the excited children of the Kaiola, Cappello, Bartol and Brinksmann families appeared on their front steps. After a few songs, they offered the singers sugar cookies and peanut butter kisses before the chorus moved on to the next South Philly location. 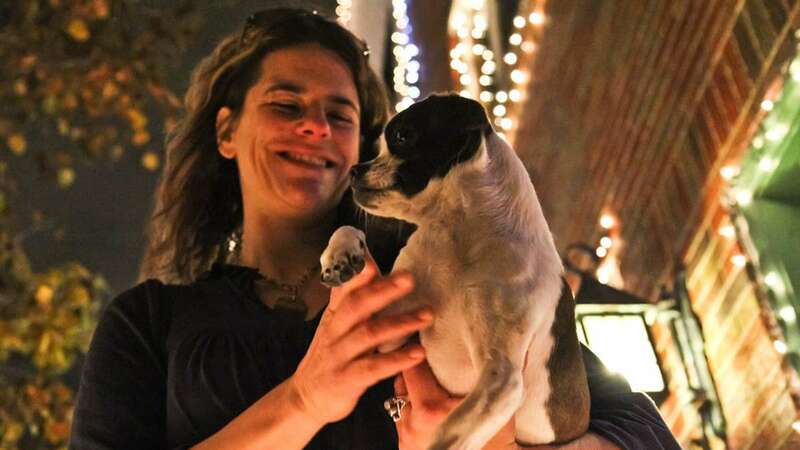 Deborah Kaiola and her dog Buzz, residents of 13th Street, were in the middle of baking Christmas cookies when the carolers arrived. Kaiola, who said the carolers made this year extra special, said she was amazed by their 12-part harmonies. 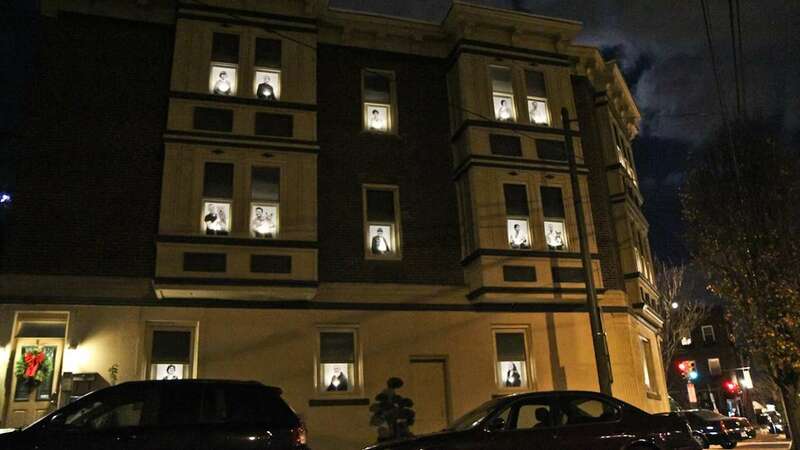 Blocks away, at the corner of Passyunk Avenue and Tasker Street, residents of an apartment building have installed silhouettes of themselves in the windows of the three-story building. A sign on the door, explaining that it’s the building’s “holiday greeting card” to the neighborhood, and offers a key to the portraits, introducing the residents and their pets. Two residents who moved in last year, “Dave and Kate,” are behind the display. 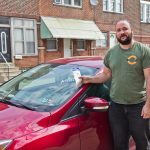 “Whoever said cities aren’t friendly doesn’t live on E. Passyunk Avenue!” the sign proclaims. 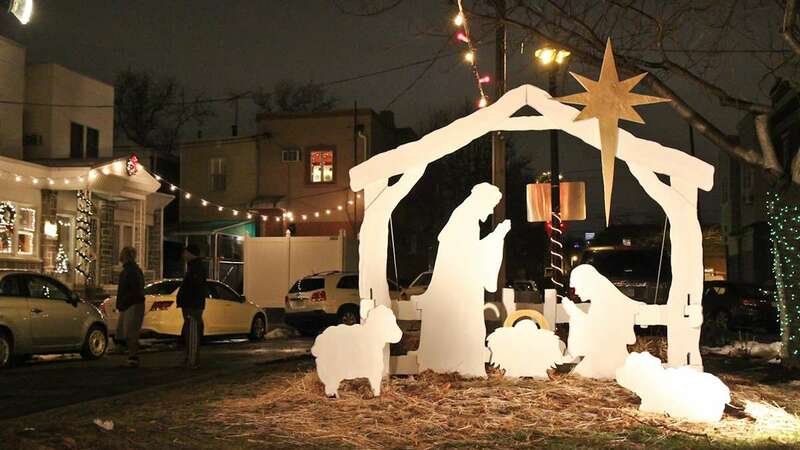 At Colorado Terrace, a small block on Colorado Street, a group of neighbors has worked together on a Christmas display every year for a decade. 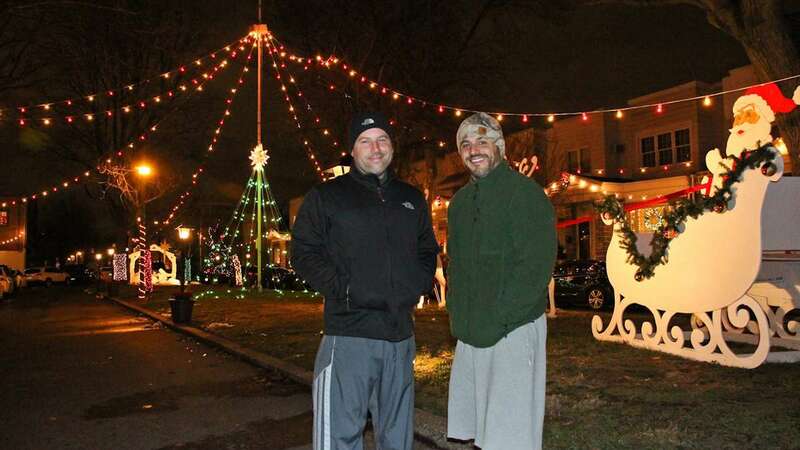 On a brisk and clear night, Charlie Valentino and Pete Conicelli attended to the finicky “Merry Christmas” sign that greets visitors to the block. Valentino and Conicelli, along with a few other residents, start putting up Christmas lights in September so by Thanksgiving they’re ready to flip the switch. Each year, the residents add a little more to the display. This year, two enormous wooden reindeer joined Santa’s sleigh. And wreaths have been placed at the peak of each home. 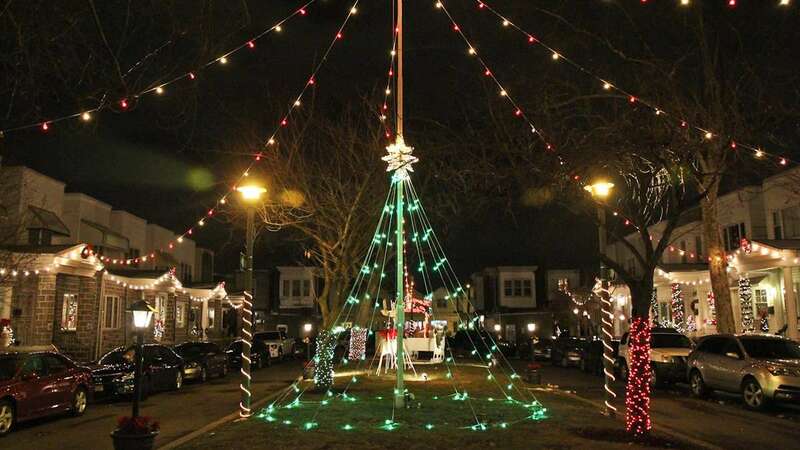 The last step in the Colorado Terrace neighborhood tradition is to light the 16-foot tree in the middle of the street while enjoying Mad Elf ale, a local beer only released around the holidays. 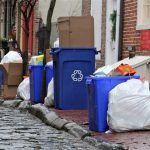 The holiday display brings the entire neighborhood together. 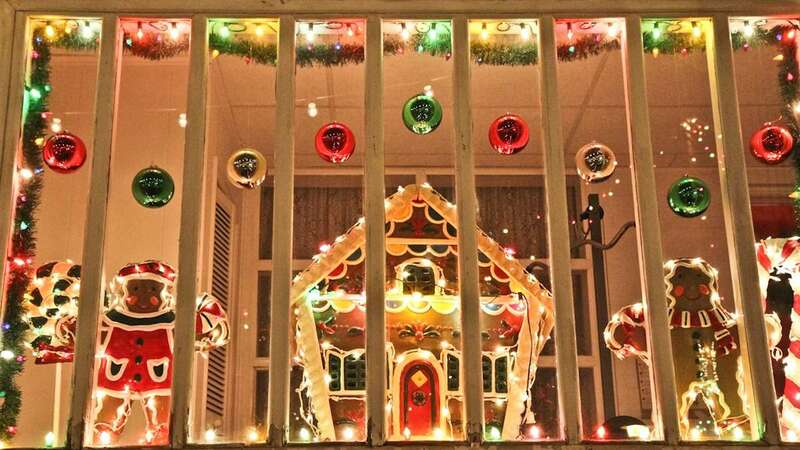 Nearly every front window is decorated from the inside — with the exception of one house. 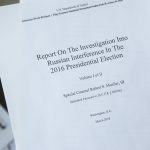 The dark window is a reminder, said Valentino and Conicelli, that an elderly neighbor is in the hospital this year. But the outside of the house is strung with lights, and a wreath adorns its peak.